This, not coincidentally follows upon a film “The Look of Silence” in which a young Indonesian man begins to explore the history of the brutal slaughter of around a million people following the CIA orchestrated coup that brought Sukarno to power in 1965. The film is banned in Indonesia but making the rounds clandestinely. Even a decade after the removal of Sukarno the authorities, many of who were involved directly in the bloodletting, don't want it talked about. In an echo of that era, those who dare mention the terror of 1965 are being labeled “communists,” which was used as a justification for murder in the past. Recent elections in Guatemala, a country with a very similar story, where most parties are hard-right and intimately connected with a recent dictatorship committing genocide, resulted in the victory of Jimmy Morales, an evangelical right-wing nationalist backed by the military. Guatemala is still living in the shadow of the genocide of Mayans by a the brutal dictator Rios Montt, installed in a coup orchestrated by the CIA and the Reagan administration in 1982. As in Indonesia, many government positions remain filled by the perpetrators of that genocide. And the violence continues. This is a story that is repeated in many places around the world including Iran, Chile, El Salvador, Congo and many other countries in the CIA's bloody wake. The system they installed in those places is, to use the “F” word, fascism, or more precisely in those places, imposed fascism or fascism by proxy. What strikes me is how stubborn the grip of fascism is in many of those places even after the fall of those regimes. As with all such heavy terms, a clear definition is needed. 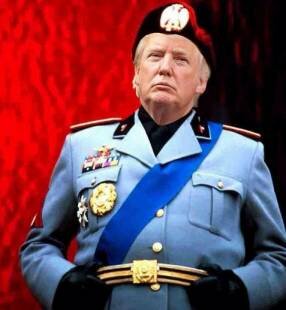 Fascism, as defined by its founder Benito Mussolini is The marriage of corporation and state. He clarified his vision saying “Fascism should more appropriately be called Corporatism because it is a merger of state and corporate power.” Georgi Dimitrov witnessed German fascism up close. He defended himself successfully in a Nazi court against charges of burning down the German capital or “Reichstag,” proving that it was done by the Nazis themselves. He described that system as “the dictatorship of the most reactionary elements of financial capitalism.” There are many kinds of authoritarian tyranny but in spite of efforts by our right-wing media to confuse the public, brutal corporate dictatorship what fascism actually is. In poor countries, fascism can be imposed via military coups and puppet dictatorships by other more powerful countries in support of their corporate interests. This has been the pattern of US policy led by the CIA since the 1950's. In Guatemala, the coup was for the benefit of United Fruit, in Indonesia it was for the rubber industry, in Iran it was for the oil industry. There are many more examples but fascism and weapons have been our primary export for at least 70 years. We continue to arm dictatorships like Saudi Arabia, to train foreign armies and goon squads in brutality and at last count, have our special forces in over 130 countries. We are now escalating our presence in Syria in what looks like a proxy war with Russia echoing the insanity of the cold war. Being the rule of corporations, fascist ideology always lurks at the heart of the market system. In our own country it has ebbed and come to the fore at different times. Right-wing nationalism, colonial aggression and racist reaction were strong from the 1890s through the 1920's and again in period following WWII, reaching a peak with the McCarthy red-scare of the 1950's. It raised its ugly head again in reaction to the civil rights reforms, social progress and anti-militarism of the 1960's and 70's with the ascension of Ronald Reagan. Growing up Jewish with an awareness of recent history, I am particularly watchful for the symptoms of fascism. Beyond economics, fascism is a societal disease marked by undue corporate influence on government, militarism and a cultural military mindset defined by hyper-nationalism, suspicion of foreigners, fear of enemies, scapegoating of minorities, crushing of labor unions, anti-rationalism and rejection of science, intrusive government, a militarized police state and the prosecution of dissidents. There is a quote (often misattributed to Sinclair Lewis) that, When fascism comes to America, it will be wrapped in the flag and carrying a cross. In 1938 professor Halford E. Luccock of the Divinity School of Yale stated that when fascism arrived here it would be called “Americanism” or “The American Way” and be use by those intent on profit to cover a multitude of sins such as lawless violence the denial of civil liberties. It seems that he had good foresight. Corporate influence builds on itself. Thanks to corrupted justices on the Supreme Court, corporations are now “people” and their money “speech.” The Chamber of Commerce, the American Legislative Exchange Council (ALEC), Koch Enterprises, major industries and their lobbying fronts like the Heritage Foundation, Freedomworks and many others fund candidates loyal to them and write legislation that affects us all. The political leaders they back push trade pacts that undermine our food, environmental and job safety as well as our economic security to benefit their benefactors. The Trans-Pacific Partnership is the latest example. Since the attacks of September 2011, we have seen the rise of an increasingly intrusive and militarized police state and the growth of paranoid xenophobia. Racism and hate-groups have increased as well. The recent campaigns in the lead-up to Presidential elections are especially telling in this regard. The GOP, always glad to exploit the ignorance, anger and prejudice of its base has become entrapped in fascist ideology as candidates compete to be more right-wing than each other – and it's more than just campaign jargon. Donald Trump demonizes Mexicans and Hispanic refugee immigrants as well as those fleeing Syria. He runs on the idea of massive roundups and deportations, war mongering and privatization. Ben Carson isn't much better pushing guns, anti-Muslim bigotry, and a toxic mixture of fundamentalist religion and militarist nationalism. Candidates Fiorina, Pataki, and Graham fall back on the fascist tradition of accusing those who disagree with them of being communists. The entire Republican agenda has devolved to fascism though not all Republicans are on the same page. In fact, it is a party rife with major differences. The "Christian" Right and Libertarians have diametrically opposite views of the role of government in regulating morality and the business wing is averse to destroying the credit of the country over things like funding Planned Parenthood or to pushing draconian austerity that will crash the economy. Still, they all agree on the dominance of corporate welfare over citizen well-being and they all push hyper-nationalist xenophobia and a militarized police state. Paul Ryan, now House Speaker, is a prototypical fascist in his agenda and his connection to reactionary corporate interests. To be fair, the GOP has no monopoly on American fascism. Some Democrats like Clinton are corporatist hawks even if they are better on domestic social issues. President Obama has pushed military aggression globally. He is the first President to have an international assassination program. He has overseen the record expansion of the National Security State, persecuted journalists and truth tellers as well as pushing the Trans-Pacific Partnership deal in subservience to corporate interests. As I've written before, the CIA and National Security State are now the most powerful and unaccountable wing of our government. In serving corporate interests, it foments strife, spreading and creating proxy fascist governments from Ukraine to the Middle East and it dictates foreign policy across administrations no matter the party. I have given much thought to why people not served by this kind of ideology, people that actually bear the brunt of the corporate agendas that harm us and treat us as disposable commodities buy into it at all. I think for many it is just plain easier. The manipulation of culture, religion and hot-button issues are certainly part of it. It requires no thought, research or knowledge of history, science or of the world to simply accept this stuff and, unlike digging for uncomfortable truths, it's safe. Most of us struggle just to get by day to day fearing for our economic and real security. Fascist ideology stokes fear of change and of enemies, real or imagined. It also speaks to our frustration, to the lack of control we have over our lives and gives voice to our anger and resentments. Misplaced blame and the catharsis of judgment and hate, act as a pressure valve while protecting those actually responsible for our troubles. It must be the fault of Mexicans, Muslims, Gays, or Blacks and if you object than you must hate America. If you express any sense of economic and social justice or mention human rights or heaven forbid, the common good, then you're a godless commie! Just like in Guatemala or Indonesia. Since the attacks on Paris, the fascist language, fear-driven bigotry, xenophobia, and calls for vengeance and an increased National Security State are at a fever pitch. The embedded media pumps up fear and the Presidential contenders dance to the tune in a chorus of bellicosity which ignores the terror of our drone wars and own complicity in training and arming fanatics and that or our "allies" in Saudi Arabia and Israel. With fascist ideology all around us, what do we do? I've been distressed by the corrupt and crippled state of our political system but I see many encouraging signs as well. If you're still reading this and not foaming at the mouth and cursing my existence, that too is a sign of hope. If anything can derail the juggernaut of global corporatism, of fascism, it is awareness of the symptoms and a willingness to name the disease. We should call out candidates that run on anti-immigrant, racist, religious, science denial or hyper-nationalist platforms. Be aware of corporate agendas. Don't afraid to say the “F” word and to demand instead, real citizen representation that puts our common interests first – to insist on government of, by, and for the People. Apparently the very word Fascism is dangerous, as the definition of Fascism has changed from "corporate government" in 1980's dictionaries, to mealy mouth "oppressive dictatorship" in today's dictionaries. Corporate American dictionaries prefer to avoid the risk of including the class basis of fascism in their definitions but oppressive dictatorships are not all the same, nor are the causes of that lead to them. Capitalism when challenged morphs to fascism to defend its wealth and influence. American fascism is not as oppressively authoritarian as the proxy-fascism we have inflicted in places like Chile, Guatemala or Indonesia because it hasn't had to be. It is more similar to that in poor, predominantly Black concentration zones and in times of stress or when directly challenged. Occupy participants certainly experienced the brutality of an authoritarian police state but, most "white" people going to work and paying their bills will not so long as they do not become homeless -- and public activism can result in joblessness as some of us have found out. Lastly -- Having checked out your blog, I want to thank you for your brave efforts in trying to bring aid to Palestinians in Gaza, You are a hero in my eyes for your actions in confronting a truly brutal authoritarian regime. You have my unending respect.